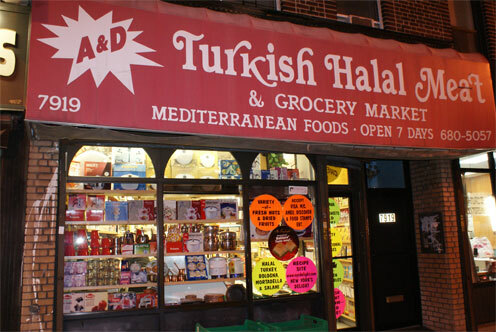 Poet’s Notes: There's this cute girl from Istanbul at the local green grocer I frequent here in Brooklyn. The story of this poem is a faithful recounting of an actual experience I had when I was getting together some food for Thanksgiving, down to the colour of her fleece, and some of the items in my cart. The poem is simple and was written about two days later on the subway when I was struck by the experience enough to figure it would be a fit for a poem. There is nothing special about its construction and it came rather naturally and quickly to me. Filtser is what my grandma called stuffing, and I make a point to continue to use her specific term for it. It may come from the dialect of German her grandparents came from—Otterberg, Rheinland-Pfalz—but I find no reference to it in standard German. Given that region is known for such dialects, and we're talking about 19th century German ancestors, it is possible that it is just a term from that region. Either way, I use it, and so it appears in my poem with an "English translation" indented to explain. Lastly, originally this poem was called a Joke in Russian, as I thought the girl was Russian, given that the ownership is Russian, and we don't have many Turks here in New York. I am glad I struck up a conversation with her and asked where she was from originally, as I'd be quite embarrassed otherwise.